FORS, the Fleet Operator Recognition Scheme, will deliver its next Safe Urban Driving (SUD) course in Antrim on 21 June to coincide with Bike Week in Northern Ireland – an annual, week-long series of events designed to encourage cycling for the general public, promoting a cleaner environment while at the same time engendering a healthier lifestyle for families. Central to the FORS Professional training programme, SUD is a fundamental element of driver training – specifically for both van and truck drivers. SUD is a one-day course delivered in two sections; a practical cycling section to provide drivers with a unique opportunity to experience the roads from a cyclist’s point of view, and a classroom theory module to talk drivers through changing streetscapes, sharing the roads safely and defensive driving techniques. As part of its drive to minimise work related road risk and to improve driving standards, SUD is a mandatory requirement for all drivers of FORS Silver accredited members. In its bid to support and encourage professional development, SUD is fully funded for FORS members, and is also Driver CPC-accredited. Impressively, 92% of drivers who have undertaken the FORS SUD course reported that their understanding of the issues faced by vulnerable road users has improved as a result. In addition, FORS offers many other fully funded training courses and eLearning, as well as free-to-access toolkits and resources. Under the theme ‘everyday cycling for everyone’, Bike Week is an annual series of events to promote cycling. 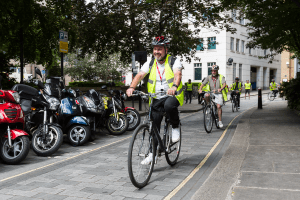 Particularly relevant for FORS is the focus on cycling in towns and cities. “Bike Week is certainly a great opportunity for cyclists,” said Peter Morrow, FORS Manager – Northern Ireland, “and, for our FORS members too, our SUD course in Antrim is perfectly timed during a period when cycling is front-of-mind for everyone. The course is fully funded for FORS members, meaning their drivers can attend the training free of charge. This is in addition to the cost-saving benefits in the longer term as a result of employing defensive driving techniques. “I know this will encourage operators to progress from FORS Bronze to FORS Silver accreditation,” he added, “and subsequently higher levels of safety, efficiency and environmental sustainability.